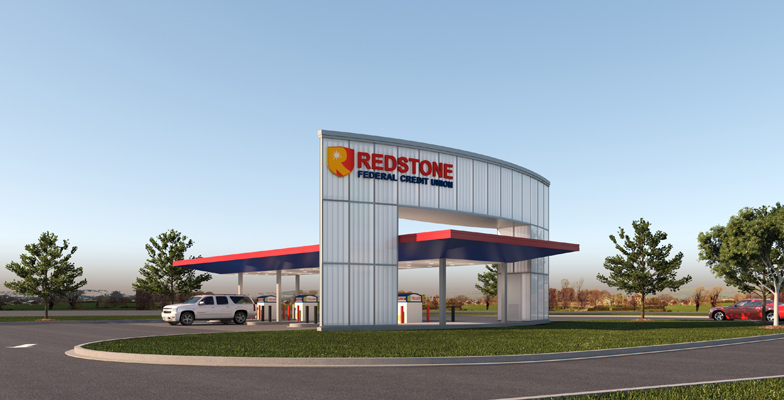 Led by Huntsville office director, Kristine Harding FAIA, the KPS team is working closely with Redstone Federal Credit Union to expand their presence across the Tennessee Valley. Three projects are currently underway – new freestanding combination branch and office buildings in Murfreesboro TN and Huntsville AL, and a new drive-thru Teller Station on North Parkway in Huntsville. The Credit Union, named one of the “best banks” in the country by Money Magazine in 2018 and 2019’s recipient of NAFCU’s Credit Union of the Year award, envisioned modern buildings evocative of their forward-thinking approach. Drone fly-overs of the downtown Huntsville site helps RFCU stakeholders understand what the project will look like in context when completed. KPS designers routinely translate design concepts and plans into 3-dimensional renderings that help owners make informed decisions about design. Using an array of sophisticated graphics programs, the design team showed RFCU decision-makers progressively more realistic depictions of what their buildings would look like as the designs evolved. Beginning with simple 2-dimensional sketches and massing models, the team provided RFCU with highly detailed 3-D renderings and drone fly-overs that have allowed them to compare design options and fully understand what their buildings will look like from all angles when completed, down to the smallest detail. 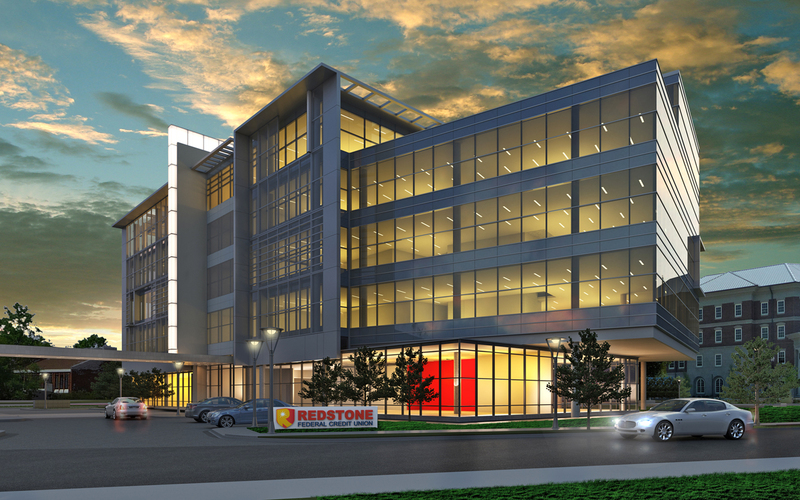 Slated for completion in 2020, Redstone Federal Credit Union’s new downtown Huntsville branch and office building at 200 Davis Circle will appear to glow as motorists travel into the city from the interstate. Close up, the building’s design of glass and metal panels will be even more impressive, with a fresh and cutting edge look. The 66,718sf building will span five floors and include a ground floor Retail Branch as well as a Community Room and Rooftop Terrace. This modern, drive-thru Teller Station will stand out for its design, convenience, and functionality. Featuring video teller services as well as general ATM functions, it is slated to open early in 2019. Currently under construction, the new flagship Tennessee branch office on Medical Center Parkway in Murfreesboro is anticipated to open in the fall of 2019. The 28,000sf complex will incorporate a retail branch, administrative office space, and a call center, with a Community Room and Terrace on the top floor.